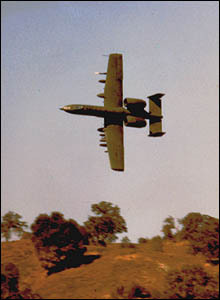 In 1973 the Fairchild-Republic Company of Farmingdale was selected to build the A-10, the first Air Force plane specifically designed for close air support. Designed for the accurate delivery of ordnance at low altitude, the A-10 is the most heavily armed, and armored, plane in history. As it was originally designed to cou nter Soviet tanks in Europe, the A-10 is equipped with up to 16,000 pounds of Maverick missiles, laser-guided bombs and a seven-barrel 30mm GAU/8A "Gatling Gun" cannon. Able to fire up to 4200 rounds per minute, no attack aircraft in history has ever mounted a gun with the tank-killing capability of the GAU/8A. The A-10 was also designed to be able to survive in an intense anti-aircraft environment including anti-aircraft guns, radar-guided and infrared missiles, and be able to absorb battle damage and keep flying. In fact, the A-10 is probably the most difficult plane to shoot down ever built, due to its extreme maneuverability, electronic countermeasures, self-sealing fuel tanks, widely separated jet engines, twin tails, manual backup flight control system and redundant wing spars. The pilot and vital flight control elements are also protected by 1" thick titanium armor plate. A total of 713 A-10's were built through 1984, at a cost of only $20 million each, and about 300 will serve with the USAF until 2015. A-10's were widely used in the 1991 Persian Gulf War Where they demonstrated their ability as the greatest tank-killing aircraft in history. A total of 144 A-10's were deployed to the Gulf and they flew 8624 missions with only five aircraft being lost. They destroyed a total of 967 tanks, 1026 pieces of artillery, 1306 trucks, 281 military structures, 53 Scud missiles, 10 aircraft on the ground and two aircraft in the air. 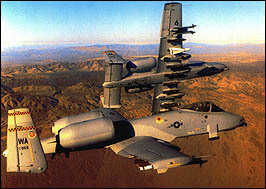 Pilots often flew up to three missions per day and in all A-10's accounted for destroying 1/4 of Iraq's entire arsenal. Several aircraft survived direct hits from heat-seeking missiles and managed to return to base. This A-10 is an early production aircraft built in 1977. It served with the 354th Tactical Fighter Wing at Myrtle Beach, South Carolina, until 1982 and then with the 45th Tactical Fighter Squadron at Grissom AFB, Indiana until 1992. It spent its last two years as a battle damage repair training aircraft. It is now in the markings of Captain Michael Baltzer of Albertson, who flew 33 A-10 missions during the Gulf War.